Did you know that Parisians women have technically been banned from wearing trousers since 1800? This outdated law was never changed and at last, ten French MPs have submitted a bill to parliament to see it overturned. Gerard Charasse, one of the MPs proposing to change the law, said: "It is fundamentally outdated and clearly wrong that this obsolete rule is still in place". Fortunately for Parisian women, this law has not been enforced for quite sometime. Interestingly, over the years, there have been a few amendments made to this law. In 1892, women were permitted to wear trousers so long as they were holding the reins of a horse. In 1909, they were then allowed to be seen in them if they were either on a bicycle or holding it by the handlebars. There was an attempt in 1969 to scrap the law but it was then thought 'unwise'. 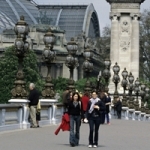 Next time you are in Paris, be aware that you could be fined or even arrested for wearing trousers. You thought the Burqa law was bad? Top that one! In 1800 dear Napoleon was laying down the law and everyone was equal, except women and anyone he didn't like! "Ce n’est pas le port du pantalon qui était visé, mais le fait pour une femme de vouloir s’habiller en homme. Il ne s’agissait pas d’une interdiction, mais de l’obligation de se présenter à la préfecture pour y être autorisée, sachant que cette autorisation ne pouvait être délivrée que pour motif médical."